There are some tattoo trends that really catch people’s attention due to their distinctive looks. Geometric tattoos can be considered one because they really look intricate and beautiful. 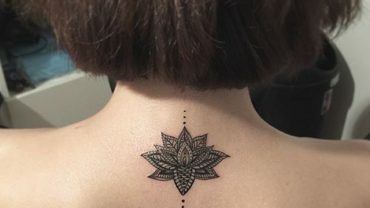 It’s not easy to create this type of tattoo because it includes repetitive patterns, such as squares, circles, and triangles. Geometric tattoo patterns can be put together to form a symbol that has cultural significance. Keeping the same size for the same pattern is far from easy. It takes skill and practice to be able to do it consistently. You can pick any design, such as an animal, a tree, a flower, or an inanimate object. Normally an object is drawn directly by creating an outline first, but for this particular style, the tattoo artist needs to draw patterns multiple times while still keeping an eye on the main design. For instance, if he wants to create an animal tattoo out of geometric patterns, he has to combine patterns repeatedly, but in the end it should form the animal it was meant to be. What’s the meaning of a geometric tattoo? There is no single meaning. It really depends on the original design. If it’s the Mandala tattoo, then the meaning would correspond to this unique symbol. Just choose any design that represents yourself in an honest way. Nearly everything can be made up of geometric shapes. A flower tattoo would also be awesome when it’s presented this way. Again, the real challenge is not straying too far from the original design. If it’s a flower, then the overlapping shapes should transform into a flower. We don’t see the tattoo style going out of style anytime soon because it’s one of the most versatile templates ever. People have a special place in their hearts for the style. Besides, the patterns are very common. We have known squares, triangles, and circles for as long as we can remember, right? They are used and known by everyone in this universe. Tattoos are all about freedom. While there are rules we need to comply with when creating a geometric tattoo, there’s no need to feel confined. The shapes can be used to create something that’s completely unique. That’s the great aspect of the geometric style. You can stick to tradition, but don’t forget to add your personal touch and make the tattoo a perfect piece of art. The style also gives us the flexibility to draw a large tattoo without fear of running out of ideas. Since it contains repeated patterns, it’s easy to expand a design way beyond the original concept. As long as the additional patterns are perfectly placed, the design will look terrific.